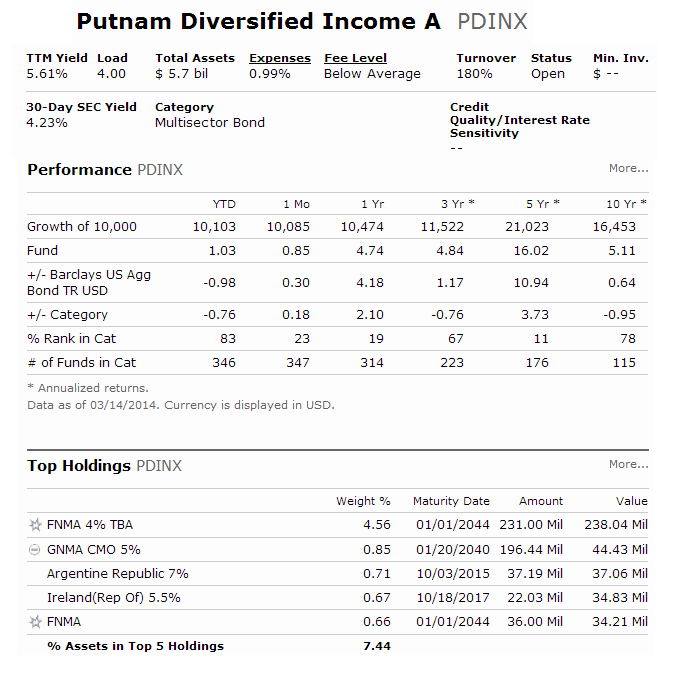 Find Putnam Diversified Income Trust (PDINX) review. This mutual fund invests in various bonds including corporate, Agency MBS CMO, etc. Multisector bond funds provide opportunity for investor to invest in a broad mix of bonds, including high yield or investment grade bonds issued by governments or corporations. Depending on the fund’s strategies, it may focus on various investment strategies. You can invest in your brokerage or retirement account such as 401k plan, Roth IRA, traditional IRA. Rising rates could undermine long-duration strategies. Find new drivers of return. Consider this fund for: All-weather income. The fund seeks high current income. Managed duration. Employing strategies to reduce interest-rate risk. Sector expertise. Pursuing opportunities that require extensive fundamental research. Broadly diversified. Investing in sectors within and beyond traditional benchmarks. The veteran team looks beyond the benchmark for overlooked and undervalued opportunities. Request a prospectus or summary prospectus from your financial representative or by calling Putnam at 1-800-225-1581. The prospective include investment objectives, risks, fees, expenses, and other information carefully before investing. 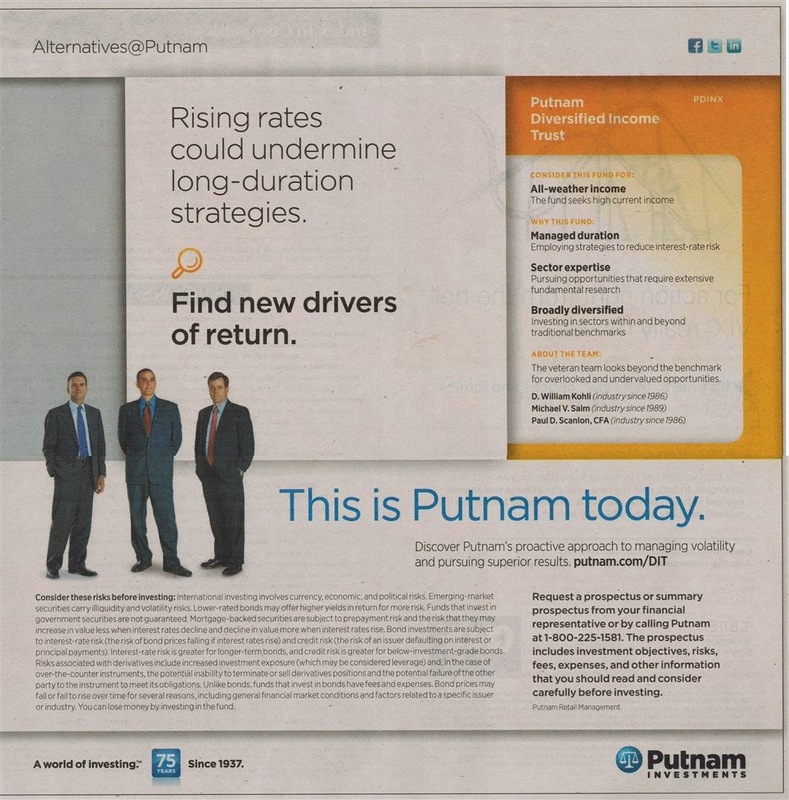 The Putnam Diversified Income Fund was incepted in October 3, 1988. It is currently managed by D. William Kohli, Michael J. Atkin, Kevin F. Murphy, Michael V. Salm and Paul D. Scanlon. The total net assets are $5.4 billion. This bond fund has a high dividend yield of 5.67%. The yield is distributed monthly. The annual expense ratio is 0.99%. The average maturity is 6.8 years and the average duration is -1.88 years. The top country allocation is United States (83.37%). The top 10 holdings as of December 2013 represent 10.31% of the total portfolio. The top sector weightings are High-yield corporate bonds (23.94%) and Agency CMO (22.48%). This Putnam Diversified Income Fund (PDINX) has a low rating. The fund performance has been improving for the past 2 years. If you are interested in this fund, you should only invest in it as an alternative bond fund.